Spark ignition engines such as the ones found in a typical car or motorcycle require a device to deliver the high voltage electric current generated by the ignition system directly to the compressed fuel/air mixture in the combustion chamber to ignite it. This device, called a spark plug, plays a very necessary role in the operation of an engine and to keep your Honda CB125E runnning at its best the spark plug will periodically require attention. Honda recommends that the spark plug in your CB125E is inspected every 4000km (2500 miles) and replaced every 8000km (5000 miles), a very reasonable service interval on a component that is a very important part of the combustion process. The CB125 seems to be very kind to its spark plugs and you could probably go a little further than this if you felt like a being a skinflint. Just bear in mind that its a single cylinder motorbike and if that cylinder cannot fire you are walking, limping the bike to a mechanic or parts store is not an option. My own spark plug service interval is different to Hondas recommendations, as they always seem to be. My cars and motorcycles are over maintained and I only mention my own service intervals for those who are curious or want to maintain their machines so that they are in absolute peak condition at all times. I change the spark plug on my Honda CB125E every 5000km (3000 miles). This is serious overkill of course. I inspect the spark plug as it can give good insight into how the engine is running and what its mechanical state is, I then put the plug into the bikes tool kit (found under the seat) to use as a spare in the event of a roadside breakdown and replace it with a new one. Why? Spark plugs are cheap (usually no more than $5 or so) and take less than five minutes to replace. Changing the spark plug or removing it for inspection on a Honda CB125E is a piece of cake if your familiar with hand tools and have used feeler guages before. Care must be taken when removing and replacing the spark plug that the thread that the plug screws into in the cylinder head is not damaged as this can cause problems, expensive ones at that. You should also take care to ensure that no foreign objects are allowed into the engine while the spark plug is removed. A single grain of sand can damage an engine over time and that hole that you've made by removing the spark plug is a direct route into the very heart of the engine. It is a good practice to clean the area around the spark plug before you remove it. It is best to perform this task on a cold engine. Disconnect the spark plug cap (the black high tension lead sitting on top of the spark plug) by gently pulling it upwards at the same angle as the top of the spark plug. It is not held on by any screws but a friction fit to the top of the plug and it should come off without too much effort. You might have to be firm with it at best. Remove the spark plug by turning it anti-clockwise with a spark plug spanner. It should loosen off very quickly and then be easily turned the rest of the way by hand. The tool kit that comes with your Honda CB125E contains a perfectly functional spark plug spanner such as the one pictured. The tool kit is usually located in a compartment under the seat. Once removed visually inspect the spark plug for wear or damage. The electrodes should have square edges and not be rounded in any way. Inspect the ceramic insulator in the centre of the plug for cracks or chips. If it appears to be in good condition the gap should be checked before reinstallation. If you are inspecting the spark plug as part of a troubleshooting process in circumstances where the bike is not running correctly (or not at all) I strongly suggest changing the spark plug regardless of whether or not it appears servicable. 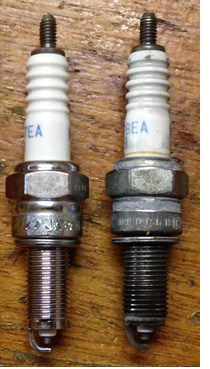 The spark plug gap, that is the distance between the electrodes, should be checked before you install the spark plug. This is true regardless of whether you are installing a new spark plug or putting the old one back in. This is done by inserting a feeler guage of the correct size between the electrodes as seen in the last picture on this page, if you feel a slight drag when you move the feeler guage within the gap the measurement is correct. Make sure that you hold the guage squarely between the electrodes and not at an angle as this will lead to an incorrect measurement. The correct gap should be between 0.80-0.90mm or 0.031-0.035in. If you are unsure or want to check your work you can use the feeler guages as a go - no go guage. That is, you should be able to slide a 0.80mm feeler guage between the electrodes but not a 0.90mm. That way the gap will be somewhere within specification. Adjusting the gap is performed by gently bending the side electrode up or down. There are tools made specifically to perform this task or you might prefer to tap the electrode on the bench gently if the gap is too wide or bend it upwards gently with a fine screwdriver if it is too small. Regardless of how you adjust the gap do it gently and remember just how small that gap is and how little you will probably need to adjust it. Take your time and dont snap the side electrode off. Once the gap is set its time to install the plug back in the engine. This is basically the reverse of removing the spark plug with a few points to remember. If it is a used plug check to make sure the plug washer is in usable condition and that it is not squashed flat or scored badly. Thread the spark plug back into the head by hand until it becomes too hard to turn. The plug should be fully threaded back in and the sealing washer should be in contact with the head. In this state the plug is considered to be seated. From here the plug is tightened in one of two ways depending on if it is a new spark plug or a used one. A used plug should be tightened 1/8 of a turn after it seats. It should feel firm when you turn it that 1/8 of a turn but not hard. A new plug should be tightened 1/2 a turn after it seats and then loosened off at least two turns. Reseat the plug as described above and then tighten it 1/8 of a turn like you would a used plug. With the spark plug tightened the final step is to reinstall the spark plug cap by sliding it firmly over the top of the spark plug. It will usually make a ziiip! noise. You should now be able to start your honda and take it for a test ride.